I'm ready to do this, Casey! You’re a passionate aspiring writer who wants to tell a story. You’re unsure of what happens next once you have finished a manuscript. You've got a million ideas for plots and can't get them to paper fast enough. You want to get clear on the bigger vision for your writing so you can create a completed manuscript for the world to read. My exclusive 1:1 author coaching is the program for the driven aspiring author who's serious about taking the idea of a novel to finished product. Sign me up, Casey! I'm SO ready! ​If you know you could benefit from the daily support, specific ‘how-to’ strategies, as well as the ‘what to do’ direction from someone who’s been there before you...and who can save you money, a lot of time and effort to help you reach your dreams 10 times faster…. Then YES this is the program for you! I never knew writing a novel was possible, but with the help of one author & a few other resources. I was able to make this dream a reality. Hiring an writing coach, someone who has been there before you and can show you the ropes is hands down the best invesment you can make. I'm proof of that. WHY HAVE ME COACH YOU? I’ve published my first book with less than $100 out of pocket and it topped the Amazon charts. Using my resources, I've continued to have consistent success with each of my 10 titles. Interestingly, I am a small town North Carolina girl who had no desire to write a book as a teen like most aspiring writers. However, when the desire ignited, I was able to take the idea to finished product in less than 6 months using the resources I had discovered with little investment. Within two months, my debut novel, Losing Charley, allowed me to replace my teaching salary and see the bigger picture as an author. Over the past 5 years, I've stayed constant in this market and know what it takes to succeed. My masters in education allows me to use strategies that work across the board and help guide you towards making your dream of writing a reality. I’ve learned a lot over the past 5 years being in this business and can give you a step by step strategy that you can implement ASAP so you can take an idea for a novel to published within 6 months. We’ll kick off our author coaching with a 60-Minute session to understand where you’re at right now, what your struggles are, and what your vision is for the next 90 days. We will get super clear on your writing goal and create a step-by-step plan for a finished manuscript. After our initial session, we will begin our weekly author coaching. Each call will be focused on specific strategies you need to take to move forward in your writing. You’ll walk away knowing exactly what you need to be working on to move closer to your publishing goals. Yes! Access to me whenever you need it. I use Voxer, the free audio app so you can ask me any questions between our session to keep up your momentum. I’ll review everything you’re working on so you if you’re stuck on something, you don’t need to wait until our next call. Reach out and I will be there for you (response guaranteed in 24-48 hours). "Casey Peeler knows how to write real, raw characters who will keep you hooked. Marleigh and Gunnison will pull you into their story of love, desire, and self-doubt, all the while leaving you begging for more. A story that will pull at your heartstrings, and have you rooting for love." Then you're serious about making a life-changing transformation in your writing from aspiring author to published author. But just to be clear...I'm looking for the passionate, driven kind of girl to help her take her writing to the next level. If you’re not willing to show up and put in the work, then we aren’t a good fit to work together. I’m only interested in working with the girl who’s relentless, who follows directions, who’s willing to do the work to make her dreams come true, and make her dream of writing a novel a reality. We are gonna work hard but you better believe we'll have a ton of fun along the way. Casey, I want this! What's the investment? $497 per month with a 3 month minimum. I currently have space for 2 more clients so if you want to be considered for a spot AND you're ready to write, apply ASAP! I'm ready to make this investment. I NEED THIS! WHAT DO I DO NEXT? I only work with a very select few women at a time and I’m fully committed to the success of my clients, applying doesn’t guarantee your spot. Please fill out the application to be considered for this a spot and I’ll personally get back to you within 24-48 hours! Once I review your application and decide you'll be a good fit for the program, we will start the program immediately. Excited? Me too! I'M IN! GIVE ME THAT APPLICATION! Hey you! 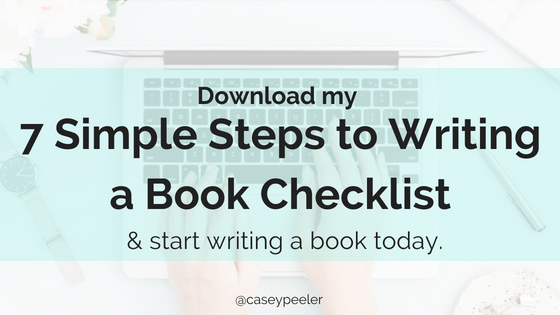 Don't leave without grabbing my 7 Simple Steps to the Writing Process Checklist. Click the button below to grab it.